There are a number of tools available to help diagnose performance problems in the I/O subsystem. vmstat provides a coarse overview of system performance. The following columns are most relevant to I/O: si (swap in), so (swap out), bi (block in), bo (block out), and wa (I/O wait time). si and so are useful when your swap space is on the same device as your data partition, and as an indicator of overall memory pressure. si and bi are read operations, while so and bo are write operations. Each of these categories is reported in kilobytes. wa is idle time; it indicates what portion of the run queue is blocked waiting for I/O complete. Analyzing your system with vmstat will give you an idea of whether or not the I/O subsystem may be responsible for any performance issues. The free, buff, and cache columns are also worth noting. The cache value increasing alongside the bo value, followed by a drop in cache and an increase in free indicates that the system is performing write-back and invalidation of the page cache. Note that the I/O numbers reported by vmstat are aggregations of all I/O to all devices. Once you have determined that there may be a performance gap in the I/O subsystem, you can examine the problem more closely with iostat, which will break down the I/O reporting by device. You can also retrieve more detailed information, such as the average request size, the number of reads and writes per second, and the amount of I/O merging going on. 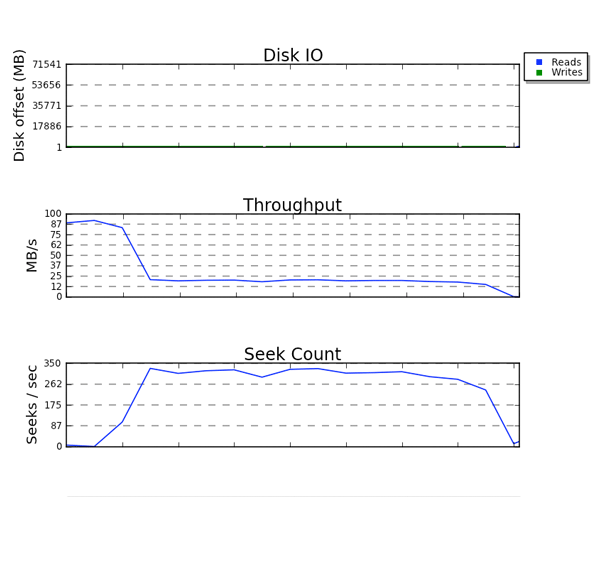 Using the average request size and the average queue size (avgqu-sz), you can make some estimations about how the storage should perform using the graphs you generated when characterizing the performance of your storage. Some generalizations apply: for example, if the average request size is 4KB and the average queue size is 1, throughput is unlikely to be extremely performant. If the performance numbers do not map to the performance you expect, you can perform more fine-grained analysis with blktrace. The blktrace suite of utilities gives fine-grained information on how much time is spent in the I/O subsystem. The output from blktrace is a set of binary trace files that can be post-processed by other utilities such as blkparse. blkparse is the companion utility to blktrace. It reads the raw output from the trace and produces a short-hand textual version. The summary shows average I/O rates, merging activity, and compares the read workload with the write workload. For the most part, however, blkparse output is too voluminous to be useful on its own. Fortunately, there are several tools to assist in visualizing the data. A newly queued block I/O was not a candidate for merging with any existing request, so a new block layer request is allocated. M — A block I/O is Merged with an existing request. I — A request is Inserted into the device's queue. D — A request is issued to the Device. C — A request is Completed by the driver. P — The block device queue is Plugged, to allow the aggregation of requests. U — The device queue is Unplugged, allowing the aggregated requests to be issued to the device. You can deduce a lot about a workload from the above table. For example, if Q2Q is much larger than Q2C, that means the application is not issuing I/O in rapid succession. Thus, any performance problems you have may not be at all related to the I/O subsystem. If D2C is very high, then the device is taking a long time to service requests. This can indicate that the device is simply overloaded (which may be due to the fact that it is a shared resource), or it could be because the workload sent down to the device is sub-optimal. If Q2G is very high, it means that there are a lot of requests queued concurrently. This could indicate that the storage is unable to keep up with the I/O load. Finally, seekwatcher consumes blktrace binary data and generates a set of plots, including Logical Block Address (LBA), throughput and seek operations per second. All plots use time as the X axis. The LBA plot shows reads and writes in different colors. It is interesting to note the relationship between the throughput and seeks/sec graphs. For storage that is seek-sensitive, there is an inverse relation between the two plots.